Despite enormous progress, we have more work to do to face the challenges of tomorrow’s economy. We’ve accomplished a lot at NewBoCo in the last three years. We are in the midst of a transformation of our economy as big and far reaching as the transition from agricultural into the industrial age. Call it “the new economy” or “the fourth industrial revolution” — hell, call it whatever, but the crux of the issue is that the rise of big data will transform the world. An important caveat: predicting the future is tough. The Jetsons assumed we’d all have flying cars and be working two hour work weeks. 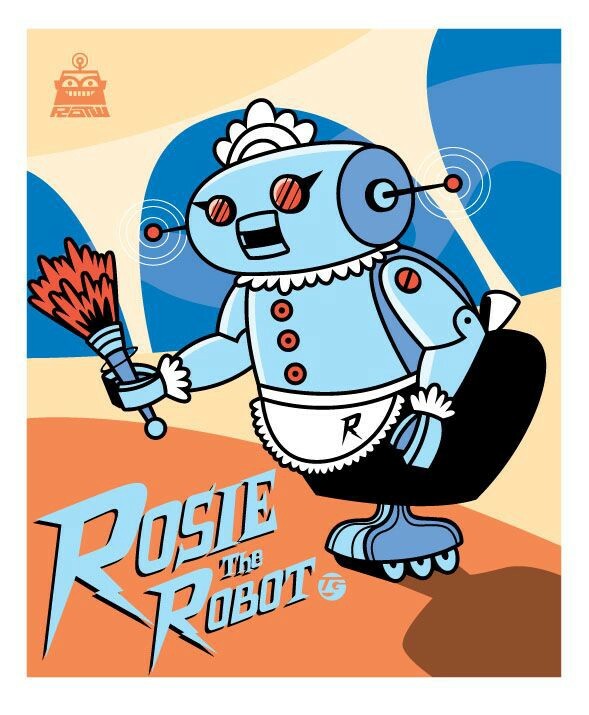 It nailed the sassy robot assistant thing at least. I’m not trying to predict the future, for a simple reason: we’re going to get it wrong. But that doesn’t mean we can’t plan for it. Last year eighty percent of all new jobs in the United States were created in metro areas with populations of one million and up. Cities like Cedar Rapids — and states like Iowa — are being left behind. The rise of machine learning and artificial intelligence has the potential to eradicate around half of the jobs in Iowa — and soon. The expectation is that those jobs will be gone by the time a kid starting kindergarten this year would be graduating from high school. Autonomous trucking is on the cusp of commercialization. What happens to all of the people who drive for a living, and all of the people whose jobs exist to support those drivers? “Truck driver” is the most common occupation in Iowa today, and we’re home to a number of large trucking firms. Online shopping has completely changed the underlying structure of our retail economy, massively eroding our property tax base — the thing that funds our city and schools. All companies are tech companies, and we’re not educating a workforce that’s qualified to fill those jobs. There are nearly ten times more open computer science jobs in Iowa right now than the number of computer science graduates last year from our public universities. The way the world works is changing. One kind of economy is replacing another. And we’re simply not doing enough to transform or build the kinds of companies and organizations that can thrive in this new economy. High-growth companies are essential to weathering these future economic changes, because without them, we can’t employ the people who are going to lose their jobs when the world switches to automation. Iowa currently has an incredibly low unemployment rate, but we can’t let that lull us into a false sense of security. We have to grow our own jobs in order to become nationally competitive. Across the state, we’re struggling to build high-growth, high-tech startups. I think Iowa’s innovation ecosystem has made incredible progress in the last few years, but the statewide numbers on startups and fast growing companies has been flat for decades. Three numbers stick out to me, all from The Kaufmann Index of Growth Entrepreneurship: State Trends, 2016 (available here). The rate of startup growth in Iowa, which measures how much startups have grown by their fifth year, has been flat since the mid 1990s. 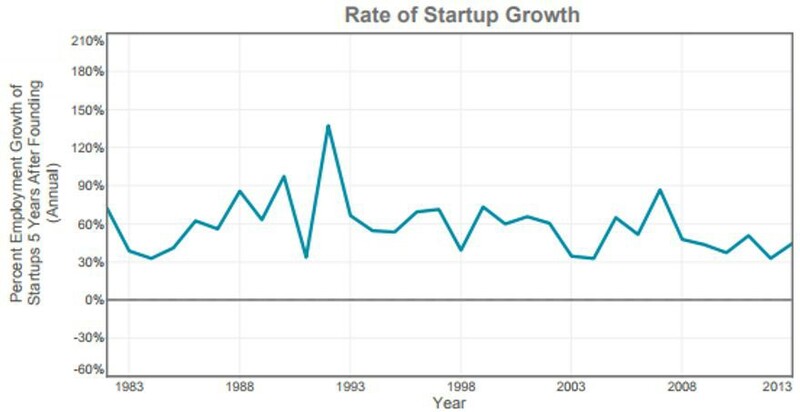 The last time we had a big rise in the rate of startup growth was when Johnny Carson still hosted The Tonight Show. 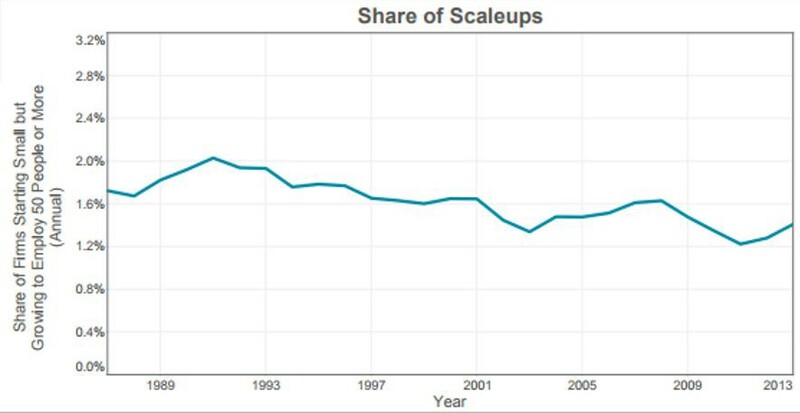 Our share of scale-ups — that’s companies that hit fifty employees by their tenth year — has been declining since the late eighties. 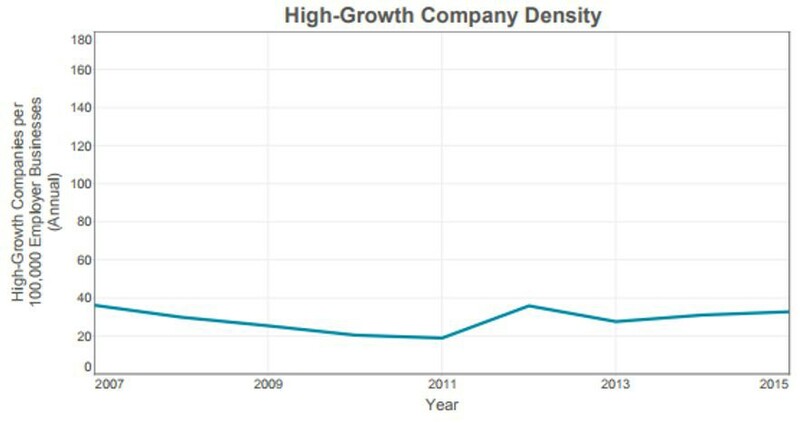 High-growth company density — that’s the number of private businesses with $2 million or more in revenue and 20% or more in annual revenue growth — has been flat for ten years. This has been flat for the entire era of the modern smartphone. How are we doing in the Creative Corridor? A year after we launched the Iowa Startup Accelerator, J&P Cycles moved operations out of the Corridor. Our region lost 125 warehouse, technical, and office jobs — more jobs than have been created by all of the companies that have gone through the Iowa Startup Accelerator in the past four years (so far). Ten Inc 5000 companies is not good enough. Source: NewBoCo analysis of Inc.com data. The Inc 5000 is a list of the 5000 fastest growing companies in the country. 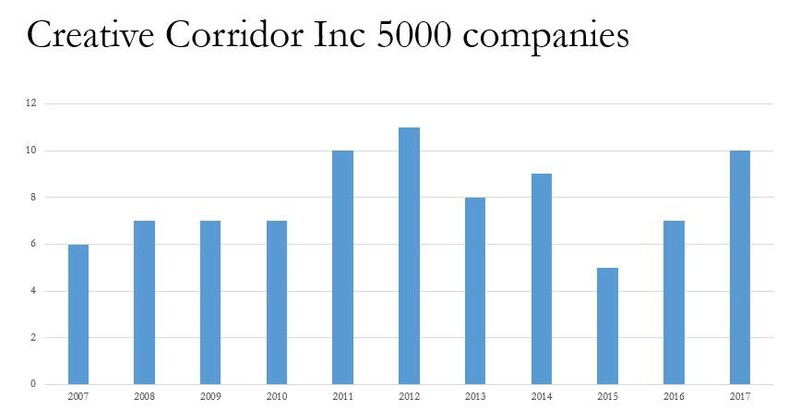 The number of companies in the Corridor that have made it onto this prestigious list has varied between four and eleven 2007 and this year, ten Corridor companies made it. These are great companies, and we’re proud that a few of them have joined us down in New Bohemia. But ten companies out of 5000 isn’t enough, and it’s not increasing. That’s just keeping pace with the status quo. It doesn’t prepare us for a world where the status quo is going to be upended. Another big problem? Our core regional industries are facing major disruption. As we mentioned before, being a truck driver is the most common job in Iowa. But did you know that it’s the most common job in 29 states? Across the entire country, there are 3.5 million truck drivers, and another 5.2 million jobs supporting those drivers. Morgan Stanley thinks that autonomous, driverless trucks will be common by 2026. If true, 8.7 million jobs could disappear in the next nine years. In a single industry. And that’s just the beginning. PwC, a UK consulting firm, thinks that 40% of jobs in the United States could be automated by 2030. That’s a conservative number. The Institute for Spatial Economic Analysis predicts that by 2035 in the Creative Corridor 55% to 58% of jobs could be automated. These are jobs across all sectors of the economy. We need to build an economy that works for people now — and ten years from now. We not only need to grow more scaling companies, we also need to educate people to be able to work at and create them. Right now, Iowa is in the midst of a major workforce crisis. Businesses are struggling to find employees with the tech skills they need for crucial, high paying jobs. In 2017, every company has jobs that need done by someone educated in computer science. There are nearly 3,800 open computing jobs in Iowa. But last year, our public universities graduated only 364 Computer Science students, and I guarantee they didn’t all stick around. The problem isn’t limited to Iowa’s universities: an estimated 75% of Iowa’s public high school, middle, and elementary schools don’t teach computer science. Iowa’s students aren’t learning the skills necessary to navigate a world where tech makes up our entire economy. We need more people with tech skills right now, and the shortage of skilled workers is only going to get worse as more and more tech jobs are needed. The problems outlined above need to be addressed on a systemic level. Building a community that can support and create high growth companies takes significant investments in education, innovation, and entrepreneurship. Our current companies need to learn how to become more innovative and resilient in order to adapt to our shifting economy. We need to help our local companies become places whose innovation and culture attract talent nationwide. In order for Iowa to lead the way in tech — or at least not fall behind — we need to have world-class technical education, starting as young as possible. We need to invest in and support our entrepreneurial community to help our startups become the high growth companies that will change our region. From universities to corporations to nonprofits, we need to do more to make sure Iowa and the Creative Corridor face these challenges head-on. I know we can do it. We’ve faced bigger challenges before. When floodwaters ravaged ten square miles of Cedar Rapids in 2008 we came back, stronger than before. When we were threatened again by rising water in 2016, we mobilized, quickly and effectively. Now we have to take that same energy and start transforming Iowa’s economy. This is the second part in a series on NewBoCo’s plans for 2022. City High School in Iowa City did not teach computer skills when our son and daughter were in school there. When my father gave our son his used computer, he lost interest in almost everything else except his friends and music. Had the school offered computer skills training, he wouldn’t have had to learn it all on his own. The job he has now depends entirely on what he taught himself. He learned about computer hardware, all about cameras, Japanese, and LG home theater equipment on his own. School quickly taught him that if he wanted to learn things that interested him, the world was open to him by computer. After that, we’re lucky he was willing to put forward enough effort to graduate from high school, and he doesn’t lack for smarts. His English teacher arm-wrestled him and convinced him to take English honors class. Boys, in particular ADHD boys, have to be interested and kept interested. Our girl, fortunately, was more obedient and willing to go to college and stay there till she graduated. They both have good jobs, but she has more credentials. BTW, our son left the state and works in North Carolina. He took his girlfriend with him. Our daughter still lives in Iowa.